Antithrombin III (henceforth referred to as antithrombin or AT) is a 58-kDa molecule belonging to the serine protease inhibitor (serpin) superfamily that plays a central role in anticoagulation and in regulating appropriate wound healing in mammalian circulation systems. Antithrombin deficiency, which may be congenital or acquired, results in increased risk for venous thrombosis and, far less commonly, arterial thrombosis. For patient education information, see the Deep Vein Thrombosis Health Center. Antithrombin belongs to the serpin family of inhibitors, which include heparin cofactor II (HCII), alpha2-antiplasmin, plasminogen activator inhibitor-1 (PAI-1), C1-inhibitor, and alpha1-antitrypsin. 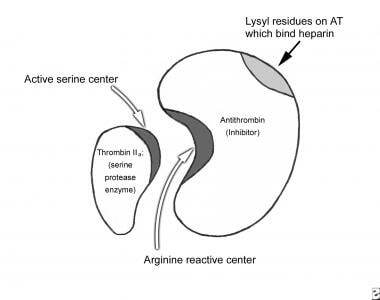 Antithrombin forms a 1:1 irreversible complex with its target active enzyme, and the complex is cleared by the liver with loss of target enzyme activity. Antithrombin is synthesized primarily in the liver. It is secreted into the plasma in the form of a molecule with a molecular weight of 58,200 kDa. The normal plasma level is 150 mcg/mL and the plasma half-life is approximately 3 days. Thus, even short periods of abnormal liver function may reduce antithrombin production, leading to potential thrombosis. The mechanism of inactivation of serine proteinases occurs in two steps, with an initial weak interaction followed by a conformational change that ‘traps’ the protease. This mechanism is depicted in the image below. Antithrombin (AT) neutralizes the enzyme (IIa) by forming a 1:1 stoichiometric complex (AT:IIa) between the arginine-serine sites of the 2 proteins. Binding of heparin to lysyl residues on AT results in a conformational change in AT, which makes it more available to bind thrombin (IIa), IXa, and Xa, thus markedly accelerating the rate of enzyme-inhibitor complex formation. AT also neutralizes XIa and XIIa. Antithrombin (AT) neutralizes the enzyme (IIa) by forming a 1:1 stoichiometric complex (AT:IIa) between the arginine-serine sites of the 2 proteins. Binding of heparin to lysyl residues on AT results in a conformational change in AT, which makes it more available to bind thrombin (IIa), IXa, and Xa, thus markedly accelerating the rate of enzyme-inhibitor complex formation. AT also neutralizes XIa and XIIa. Transformation to the final complex involves formation of a highly stable bond between the Arg393 residue on antithrombin and the catalytic Ser residue(s) on thrombin. The formation of the antithrombin-proteinase complex is accelerated by heparin and related glycosaminoglycans, reviewed elsewhere. In vitro studies have established the relative rates of thrombin generation and neutralization, but a study by Undas et al quantified the changes in the rate of activation and inactivation of several hemostatic factors in blood serially sampled from a bleeding time cut. In this in vivo test system with an active, ongoing interaction between blood components and the injured vessel wall in flowing blood, it was noted that thrombin-antithrombin (TAT) complexes started increasing within 30 seconds of the bleeding time cut and reached a maximum by 180 seconds. The pattern of increase was typical of the two phases of activation, which have been described in other models of thrombosis, with an initial 60- to 90-second initiation phase followed by a subsequent propagation phase, during which activation reaches its maximum level. In the healthy volunteers, under basal conditions, the amount of thrombin formed exceeded TAT formation at all time points tested until bleeding stopped. TAT complexes formed following the neutralization of thrombin by antithrombin have been used as a surrogate marker for thrombin generation; serial changes in TAT levels have been used to determine alterations of the extent of hemostatic activation in the course of a disease or to assess the impact of specific therapy (eg, the effect of heparin in potentially treating d isseminated intravascular coagulation). Heparin cofactor II (HCII) is another physiologic protein inhibitor of hemostasis that appears to contribute about 20-30% of plasma heparin-cofactor activity in the presence of large amounts of heparin; HCII does not, however, contribute to anti–factor Xa activity. Therefore, it has been suggested that, in the assessment of the true heparin cofactor activity of antithrombin, the anti–factor Xa activity of antithrombin be measured within 30 seconds of incubation with factor Xa in the presence of small amounts of heparin in order to exclude the contribution of HCII to this assay. The use of low doses of heparin in the test system and the use of factor Xa rather than thrombin allows for an accurate assessment of antithrombin's heparin cofactor activity with avoidance of the contribution of HCII to this assessment. Thrombomodulin, an endothelial cell receptor for thrombin, also binds antithrombin and accelerates its anticoagulant effect. In a purified system, tissue factor pathway inhibitor (TFPI) also appeared to potentiate the ability of antithrombin to neutralize activated coagulation factors. Oelschlager et al have shown that antithrombin produces a dose-dependent reduction in both lipopolysaccharide and tumor necrosis factor (TNF)–alpha activation of nuclear factor kB (NF-kB) in cultured monocytes and endothelial cells. As a result, the synthesis of proinflammatory mediators such as interleukin (IL)-6, IL-8, and TNF is decreased, leading to an anti-inflammatory effect. A number of studies have also shown that cleaved antithrombin has potent antiangiogenic and antitumor properties. Larsson and colleagues have shown that fibroblast growth factor (FGF)-induced angiogenesis in the chick embryo and angiogenesis in mouse fibrosarcoma tumors is inhibited by treatment with latent antithrombin. There is literature to suggest that latent antithrombin may also induce apoptosis of endothelial cells by disrupting cell-matrix interactions. The gene for antithrombin is located on chromosome 1 band q23.1-23.9, has 7 exons and 6 introns, and is 13.5 kilobases (kb). The promoter region does not have a TATA or CAAT box. A control element at the 5' flanking region is thought to be critical for efficient synthesis of antithrombin, with homology to an enhancer of murine and human genes. The mRNA is 1567 nucleotides long and has an approximately 175 base pair (bp) 3' untranslated region. Two modes of splicing of the primary transcript are feasible at 2 sites in the first intron; the result is either a full native antithrombin molecule or a truncated product with a portion left within the cell. Patients with AT deficiency, either inherited or acquired, are predisposed to serious venous and arterial thrombotic disease due to prolonged circulation and activity of activated coagulation factors. This increases the risk of thrombus formation at sites that fulfill Virchow's postulates (stasis, alteration of coagulability of the blood, and vessel wall damage). Even a 50% reduction in the level of antithrombin activity is sufficient to ‘tilt’ the coagulation system in favor of thrombosis. The most common thrombotic manifestations in patients with antithrombin deficiency (AT deficiency) include lower extremity deep venous thrombosis, with recurrent VTE being common. Other sites of thrombosis include the inferior vena cava, hepatic and portal veins, and renal, axillary, brachial, mesenteric, pelvic, cerebral, and retinal veins. Arterial thrombosis is far less common. Despite their increased incidence of thrombosis, individuals with antithrombin deficiency have a normal life expectancy. The European Prospective Cohort on Thrombophilia (EPCOT) study recently looked at mortality in groups of various thrombophilia patients, including antithrombin deficiency, compared with a control group from March 1994 to December 2006. Overall, they found no increased risk of death in individuals with thrombophilia. During the study period, 6.6% of patients with antithrombin deficiency died, compared with 5.1% of control patients. Additionally, they found the hazard ratio to be 1.65 with a confidence interval 0.91 to 2.93. Inherited antithrombin deficiency (AT deficiency) can be broadly classified into two types. A number of mutations in AT have been molecularly characterized. For example, the heterozygous form of a commonly inherited variant of antithrombin affecting the heparin-binding site (HBS) is not a risk factor for thrombosis. However, several cases of patients with homozygous mutations in the Heparin Binding Site (HBS) region of the antithrombin gene have been published, and homozygosity is associated with earlier presentation of thrombotic disease. Two of these cases were shown to be associated with arterial thrombotic disease. On the other hand, the replacement of the normal threonine-85 (Thr-85) by a nonpolar methionine (known as Antithrombin-Wibble) results in a mild adult-onset thrombotic disease, whereas replacement of the same Thr-85 by a polar lysine (known as Antithrombin-Wobble) results in early onset of thrombosis in childhood. Interestingly, fevers can trigger conformational stress on the Antithrombin-Wobble protein and favor thrombosis. Finally, a homozygous type of antithrombin deficiency (antithrombin III Kumamoto) has been reported to be present in a family with consanguinity. It was shown to be associated with arterial thrombotic disease. The patient developed cerebral arterial thrombosis at age 17 years and subsequently developed venous thrombosis. A current listing of mutations affecting the antithrombin gene is available at the Antithrombin Mutation Database. A review of published mutations indicates that they are distributed throughout the molecule, with reactive center defects having the biggest impact on the potential for thrombosis, and heparin-binding defects carrying the least thrombotic risk. Although it is well-recognized that inherited antithrombin deficiency (AT deficiency) confers a higher risk of coagulopathy than inherited deficiencies of protein C deficiency or p rotein S deficiency there is unpredictable variability in the incidence and severity of thrombotic manifestations in patients with inherited antithrombin deficiency. A population-based case control study found a 5-fold increased risk of thrombosis when antithrombin deficiency was associated with another genetic defect that predisposes to thrombosis. [25, 26] This risk increased to 20-fold when antithrombin deficiency was coupled with another acquired risk factor for thrombosis. Co-inherited disorders include Activated Protein C Resistance (Factor V Leiden), protein C or S deficiency, thrombomodulin gene mutations, methylene tetrahydrofolate reductase (MTHFR) deficiency, and high lipoprotein (a) levels. For healthy full-term neonates, serum AT levels are typically >50% lower than adult reference values. Newborns do not have the thrombotic tendency noted in adults with similarly reduced values because of simultaneous reductions in their procoagulant levels and perhaps due to a protective role of alpha2-macroglobulin as a thrombin inhibitor in the neonate and in childhood. Premature infants have even lower serum levels. AT levels in the newborn rise to approximately 60% of that of adult levels 1 month after birth. Genetic mutations can influence this level, but the superimposition of serious illnesses, can further reduce antithrombin due to increased consumption or decreased production. Synthesis of antithrombin and other physiologically important inhibitors of hemostasis, synthesis of procoagulants, and clearance of activated coagulation factors are all regulated by the liver. Thus, the liver plays a central role in hemostasis. The severity of liver disease correlates with reductions in antithrombin antigen levels. These reductions are not only due to impaired synthesis, but also to an element of increased consumption, particularly when additional risk factors, such as sepsis, surgery, and hypotension, are present in patients with chronic liver disease. Patients with acute, massive hepatocellular injury and elevations of liver enzyme levels can often have a significantly larger component of a consumptive process than patients with slowly progressive end-stage liver disease. Because of the decreased synthesis of inhibitors as well as the decreased ability to clear activated coagulation factors, patients undergoing orthotopic liver transplantation predictably develop DIC with reduction inantithrombin levels. Veno-occlusive hepatic disease is seen in patients who undergo bone marrow transplantation, particularly in unrelated-donor transplantations, and it is associated with the development of microthrombi in the terminal hepatic venules. This results in rapid, marked deterioration of liver function, causing a coagulopathy characterized by the reduction in the level of antithrombin and, consequently, significant morbidity and mortality. Interest in the role of antithrombin deficiency in the setting of sepsis and the critically ill patient has been growing. There appears to be a correlation between the severity of illness and the degree of antithrombin reduction. However, to what extent the depletion of antithrombin affects the clinical condition of such patients, or whether a reduction in the levels of antithrombin is merely a marker of inflammation and illness, remains to be determined. Nonetheless, the use of supplemental antithrombin in septic patients remains controversial. Further analysis with large, randomized control studies will be required before definitive recommendations can be made. Heparin, given by intravenous or subcutaneous routes, causes an approximately 30% reduction in antithrombin levels, presumably due to rapid clearance in vivo of heparin-antithrombin complexes. Plasma samples to determine baseline antithrombin levels must therefore not be drawn after exposure to heparin. A large body of literature shows that estrogens/oral contraceptives can also reduce antithrombin levels, potentially resulting in hypercoagulability (See Hypercoagulability - Hereditary Thrombophilia and Lupus Anticoagulants Associated With Venous Thrombosis and Emboli). An autosomal dominant trait, inherited antithrombin (AT) deficiency has a prevalence between 0.2/1000 and 0.5/1000. In the general population, the incidence is thought to be in the range of 0.2-0.4%. Patients who are heterozygous for type I or II antithrombin (AT) deficiency develop significant thromboembolic complications, generally involving the deep veins. The lifetime risk of developing venous thromboembolism (VTE) depends on the subtype of antithrombin deficiency. In patients with type I inherited AT deficiency, the risk of thrombosis is estimated to be 1% per year, starting at age 15 years. The overall lifetime risk of developing a thrombotic event in patients with type I inherited AT deficiency is estimated to range from 50% to 85%. Patients may develop recurrent VTE at an early age and, if the condition is unrecognized or inadequately treated, they may die from such events. Long-term consequences, such as chronic leg ulcerations, severe venous varicosities, and postphlebitic syndrome, are common from repeated episodes of VTE, which cause significant morbidity. The prognosis of patients with reductions in antithrombin as part of other systemic disorders depends on the underlying disorder. The frequency of arterial thrombotic complications is low in patients with antithrombin deficiency. However, mutations leading to arterial thromboses have been described. Pregnancy-related complications associated with antithrombin deficiency include recurrent fetal loss, preeclampsia, and others (eg, hypertension; thrombocytopenia; DIC syndromes; hemolysis, elevated liver enzymes, and low platelet count [HELLP]). The incidence of pregnancy-related VTE in women with antithrombin deficiency could be as high as 50%. Thrombotic complications during embryogenesis can lead to a variety of developmental abnormalities. Nephrotic syndrome has been associated with reductions in antithrombin and an increased incidence of venous thrombosis (renal vein, 60%; VTE, 40%) with only a 3% incidence of arterial thrombosis. Both men and women can present with the inherited disorder. Clinical manifestations of antithrombin deficiency (AT deficiency) are evident at an early or later age, depending on the severity of the inherited genetic defect and also on the co-inheritance or presence of other thrombophilic mutations, drugs, or diseases. Neonates normally have approximately 60% of adult antithrombin levels despite the absence of a prothrombotic state. Premature infants have even lower values. Thus, a reduction in antithrombin level in these instances does not automatically imply an inherited deficiency. Serial follow-up may be necessary in families with inherited antithrombin deficiency (AT deficiency) to prove an inherited deficiency of antithrombin. If the genetic mutation in the family is known, the diagnosis is much simplified by the presence or absence of the specific mutation. The severely affected homozygous form of antithrombin deficiency may lead to spontaneous fetal loss, babies born small for their gestational age due to a small placenta secondary to thrombosed placental vessels, or severe thrombotic problems at birth. In other instances, thrombotic manifestations may start in the teenage years. Acquired antithrombin reductions are usually secondary to other illnesses or drugs. Irving JA, Pike RN, Lesk AM, Whisstock JC. Phylogeny of the serpin superfamily: implications of patterns of amino acid conservation for structure and function. Genome Res. 2000 Dec. 10(12):1845-64. [Medline]. [Full Text]. Irving JA, Steenbakkers PJ, Lesk AM, et al. Serpins in prokaryotes. Mol Biol Evol. 2002 Nov. 19(11):1881-90. [Medline]. [Full Text]. Olds RJ, Lane DA, Mille B, Chowdhury V, Thein SL. Antithrombin: the principal inhibitor of thrombin. Semin Thromb Hemost. 1994. 20(4):353-72. [Medline]. Rosenberg JS, McKenna PW, Rosenberg RD. Inhibition of human factor IXa by human antithrombin. J Biol Chem. 1975 Dec 10. 250(23):8883-8. [Medline]. [Full Text]. Stead N, Kaplan AP, Rosenberg RD. Inhibition of activated factor XII by antithrombin-heparin cofactor. J Biol Chem. 1976 Nov 10. 251(21):6481-8. [Medline]. [Full Text]. Rao LV, Nordfang O, Hoang AD, Pendurthi UR. Mechanism of antithrombin III inhibition of factor VIIa/tissue factor activity on cell surfaces. Comparison with tissue factor pathway inhibitor/factor Xa-induced inhibition of factor VIIa/tissue factor activity. Blood. 1995 Jan 1. 85(1):121-9. [Medline]. Okajima K, Uchiba M. The anti-inflammatory properties of antithrombin III: new therapeutic implications. Semin Thromb Hemost. 1998. 24(1):27-32. [Medline]. Yamashiro K, Kiryu J, Tsujikawa A, et al. Inhibitory effects of antithrombin III against leukocyte rolling and infiltration during endotoxin-induced uveitis in rats. Invest Ophthalmol Vis Sci. 2001 Jun. 42(7):1553-60. [Medline]. [Full Text]. Dunzendorfer S, Kaneider N, Rabensteiner A, et al. Cell-surface heparan sulfate proteoglycan-mediated regulation of human neutrophil migration by the serpin antithrombin III. Blood. 2001 Feb 15. 97(4):1079-85. [Medline]. [Full Text]. Foy P, Moll S. Thrombophilia: 2009 update. Curr Treat Options Cardiovasc Med. 2009 Apr. 11(2):114-28. [Medline]. Egeberg O. Inherited antithrombin deficiency causing thrombophilia. Thromb Diath Haemorrh. 1965 Jun 15. 13:516-30. [Medline]. Abildgaard U. Antithrombin--early prophecies and present challenges. Thromb Haemost. 2007 Jul. 98(1):97-104. [Medline]. [Full Text]. Picard V, Nowak-Gottl U, Biron-Andreani C, et al. Molecular bases of antithrombin deficiency: twenty-two novel mutations in the antithrombin gene. Hum Mutat. 2006 Jun. 27(6):600. [Medline]. [Full Text]. Steiner M, Steiner B, Rolfs A, et al. Antithrombin gene mutation 5356-5364*delCTT with type I deficiency and early-onset thrombophilia and a brief review of the antithrombin alpha-helix D molecular pathology. Ann Hematol. 2005 Jan. 84(1):56-8. [Medline]. Wang WB, Fu QH, Ding QL, et al. Characterization of molecular defect of 13387-9delG mutated antithrombin in inherited type I antithrombin deficiency. Blood Coagul Fibrinolysis. 2005 Mar. 16(2):149-55. [Medline]. 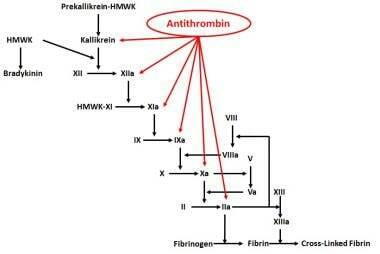 Patnaik MM, Moll S. Inherited antithrombin deficiency: a review. Haemophilia. 2008 Nov. 14(6):1229-39. [Medline]. Lijfering WM, Brouwer JL, Veeger NJ, Bank I, Coppens M, Middeldorp S, et al. Selective testing for thrombophilia in patients with first venous thrombosis: results from a retrospective family cohort study on absolute thrombotic risk for currently known thrombophilic defects in 2479 relatives. Blood. 2009 May 21. 113(21):5314-22. [Medline]. Picard V, Chen JM, Tardy B, Aillaud MF, Boiteux-Vergnes C, Dreyfus M, et al. Detection and characterisation of large SERPINC1 deletions in type I inherited antithrombin deficiency. Hum Genet. 2009 Sep 17. [Medline]. Huntington JA, Read RJ, Carrell RW. Structure of a serpin-protease complex shows inhibition by deformation. Nature. 2000 Oct 19. 407(6806):923-6. [Medline]. van Boven HH, Lane DA. Antithrombin and its inherited deficiency states. Semin Hematol. 1997 Jul. 34(3):188-204. [Medline]. Maclean PS, Tait RC. Hereditary and acquired antithrombin deficiency: epidemiology, pathogenesis and treatment options. Drugs. 2007. 67(10):1429-40. [Medline]. Undas A, Brummel K, Musial J, Mann KG, Szczeklik A. Blood coagulation at the site of microvascular injury: effects of low-dose aspirin. Blood. 2001 Oct 15. 98(8):2423-31. [Medline]. [Full Text]. Roemisch J, Gray E, Hoffmann JN, Wiedermann CJ. Antithrombin: a new look at the actions of a serine protease inhibitor. Blood Coagul Fibrinolysis. 2002 Dec. 13(8):657-70. [Medline]. van Boven HH, Vandenbroucke JP, Briët E, Rosendaal FR. Gene-gene and gene-environment interactions determine risk of thrombosis in families with inherited antithrombin deficiency. Blood. 1999 Oct 15. 94(8):2590-4. [Medline]. Cooper PC, Coath F, Daly ME, Makris M. The phenotypic and genetic assessment of antithrombin deficiency. Int J Lab Hematol. 2011 Jun. 33(3):227-37. [Medline]. Bayston T, Lane D, for the Plasma Coagulation Inhibitors Subcommittee of the Scientific and Standardization Committee of the International Society on Thrombosis and Haemostasis. Antithrombin mutation database. Imperial College London. Available at http://www1.imperial.ac.uk/medicine/about/divisions/is/haemo/coag/antithrombin/. Accessed: December 12, 2008. Yamada T, Kuwata T, Matsuda H, Deguchi K, Morikawa M, Yamada T, et al. Risk Factors of Eclampsia Other Than Hypertension: Pregnancy-Induced Antithrombin Deficiency and Extraordinary Weight Gain. Hypertens Pregnancy. 2011 Dec 9. [Medline]. Niebler RA, Christensen M, Berens R, Wellner H, Mikhailov T, Tweddell JS. Antithrombin replacement during extracorporeal membrane oxygenation. Artif Organs. 2011 Nov. 35(11):1024-8. [Medline]. Wickstrom K, Edelstam G, Lowbeer CH, Hansson LO, Siegbahn A. Reference intervals for plasma levels of fibronectin, von Willebrand factor, free protein S and antithrombin during third-trimester pregnancy. Scand J Clin Lab Invest. 2004. 64(1):31-40. [Medline]. Morikawa M, Yamada T, Kataoka S, et al. Changes in antithrombin activity and platelet counts in the late stage of twin and triplet pregnancies. Semin Thromb Hemost. 2005 Jun. 31(3):290-6. [Medline]. D''Uva M, Di Micco P, Strina I, Ranieri A, Alviggi C, Mollo A, et al. Etiology of hypercoagulable state in women with recurrent fetal loss without other causes of miscarriage from Southern Italy: new clinical target for antithrombotic therapy. Biologics. 2008 Dec. 2(4):897-902. [Medline]. [Full Text]. Hara T, Naito K. Inherited antithrombin deficiency and end stage renal disease. Med Sci Monit. 2005 Nov. 11(11):RA346-54. [Medline]. Bushman JE, Palmieri D, Whinna HC, Church FC. Insight into the mechanism of asparaginase-induced depletion of antithrombin III in treatment of childhood acute lymphoblastic leukemia. Leuk Res. 2000 Jul. 24(7):559-65. [Medline]. McColl M, Tait RC, Walker ID, et al. Low thrombosis rate seen in blood donors and their relatives with inherited deficiencies of antithrombin and protein C: correlation with type of defect, family history, and absence of the factor V Leiden mutation. Blood Coagul Fibrinolysis. 1996 Oct. 7(7):689-94. [Medline]. Martinelli I, Mannucci PM, De Stefano V, et al. Different risks of thrombosis in four coagulation defects associated with inherited thrombophilia: a study of 150 families. Blood. 1998 Oct 1. 92(7):2353-8. [Medline]. Tait RC, Walker ID, Perry DJ et al. Prevalence of antithrombin III deficiency subtypes in 4000 healthy blood donors [abstract]. Thromb Haemost. 1991. 65:839. Kurihara M, Watanabe K, Inoue S, et al. Characterization of two novel mutations of the antithrombin gene observed in Japanese thrombophilic patients. Thromb Res. 2005. 115(5):351-8. [Medline]. Roozendaal B, Schoorlemmer GH, Wiersma A, et al. Opposite effects of central amygdaloid vasopressin and oxytocin on the regulation of conditioned stress responses in male rats. Ann N Y Acad Sci. 1992 Jun 12. 652:460-1. [Medline]. Alvi AR, Khan S, Niazi SK, Ghulam M, Bibi S. Acute mesenteric venous thrombosis: improved outcome with early diagnosis and prompt anticoagulation therapy. Int J Surg. 2009 Jun. 7(3):210-3. [Medline]. Dunbar NM, Chandler WL. Thrombin generation in trauma patients. Transfusion. 2009 Aug 4. [Medline]. Rodgers GM. Role of antithrombin concentrate in treatment of hereditary antithrombin deficiency. An update. Thromb Haemost. 2009 May. 101(5):806-12. [Medline]. Azzi A, De Santis R, Morfini M, et al. TT virus contaminates first-generation recombinant factor VIII concentrates. Blood. 2001 Oct 15. 98(8):2571-3. [Medline]. [Full Text]. MediView Express. Recombinant therapy enhances safety and quality of life for hemophilia patients. Paper presented at: 53rd Annual Meeting of the National Hemophilia Foundation; November 16, 2001; Nashville, Tennessee. Rigas B, Hasan I, Rehman R, et al. Effect on treatment outcome of coinfection with SEN viruses in patients with hepatitis C. Lancet. 2001 Dec 8. 358(9297):1961-2. [Medline]. PLAS+SD (Pooled Plasma, (Human) Solvent Detergent Treated). [package insert]. Watertown, Mass: V. I. Technologies, Inc. (VITEX). Distributed by the American National Red Cross, Blood Services, Washington, DC. 2000. Fergusson DA, Hebert PC, Mazer CD, et al. A comparison of aprotinin and lysine analogues in high-risk cardiac surgery. N Engl J Med. 2008 May 29. 358(22):2319-31. [Medline]. [Full Text]. Senior K. New variant CJD fears threaten blood supplies. Lancet. 2001 Jul 28. 358(9278):304. [Medline]. Bertina RM. Molecular risk factors for thrombosis. Thromb Haemost. 1999 Aug. 82(2):601-9. [Medline]. Binnetoglu FK, Babaoglu K, Sarper N, Bek K. A huge intracardiac thrombus developed in the presence of antithrombin III deficiency in a patient with end-stage renal failure. Turk Kardiyol Dern Ars. 2013 Oct. 41(7):642-5. [Medline]. Coukos G, Rubin SC. Gene therapy for ovarian cancer. Oncology (Williston Park). 2001 Sep. 15(9):1197-204, 1207; discussion 1207-8. [Medline]. Di Bisceglie AM. SEN and sensibility: interactions between newly discovered and other hepatitis viruses?. Lancet. 2001 Dec 8. 358(9297):1925-6. [Medline]. Di Minno MN, Dentali F, Lupoli R, Ageno W. Mild Antithrombin Deficiency and the Risk of Recurrent Venous Thromboembolism: A Prospective Cohort Study. Circulation. 2013 Oct 21. [Medline]. Hedner U, Ginsburg D, Lusher JM, High KA. Congenital hemorrhagic disorders: new insights into the pathophysiology and treatment of hemophilia. Hematology Am Soc Hematol Educ Program. 2000. 241-65. [Medline]. [Full Text]. Hoffman M, Monroe DM 3rd. A cell-based model of hemostasis. Thromb Haemost. 2001 Jun. 85(6):958-65. [Medline]. James AH, Konkle BA, Bauer KA. Prevention and treatment of venous thromboembolism in pregnancy in patients with hereditary antithrombin deficiency. Int J Womens Health. 2013. 5:233-41. [Medline]. [Full Text]. Kearon C, Julian JA, Kovacs MJ, Anderson DR, Wells P, Mackinnon B, et al. Influence of thrombophilia on risk of recurrent venous thromboembolism while on warfarin: results from a randomized trial. Blood. 2008 Dec 1. 112(12):4432-6. [Medline]. Lane DA, Bayston T, Olds RJ, et al. Antithrombin mutation database: 2nd (1997) update. For the Plasma Coagulation Inhibitors Subcommittee of the Scientific and Standardization Committee of the International Society on Thrombosis and Haemostasis. Thromb Haemost. 1997 Jan. 77(1):197-211. [Medline]. Luxembourg B, Pavlova A, Geisen C, Spannagl M, Bergmann F, Krause M, et al. Impact of the type of SERPINC1 mutation and subtype of antithrombin deficiency on the thrombotic phenotype in hereditary antithrombin deficiency. Thromb Haemost. 2013 Nov 7. 111(2):[Medline]. Ranta S, Heyman MM, Jahnukainen K, Taskinen M, Saarinen-Pihkala UM, Frisk T, et al. Antithrombin deficiency after prolonged asparaginase treatment in children with acute lymphoblastic leukemia. Blood Coagul Fibrinolysis. 2013 Oct. 24(7):749-56. [Medline]. Reitsma PH. Genetic principles underlying disorders of procoagulant and. Colman RW, Hirsh J, Marder VJ, Clowes AW, George JN, eds. Hemostasis and Thrombosis: Basic Principles and Clinical Practice. 4th ed. Philadelphia, Pa: Lippincott Williams & Wilkins; 2001. 60-87. Rosenberg RD, Edelberg JM, Zhang L. The heparin-antithrombin system: a natural anticoagulant mechanism. Colman RW, Hirsh J, Marder VJ, Clowes AW, George JN, eds. Hemostasis and Thrombosis: Basic Principles and Clinical Practice. 4th ed. Philadelphia, Pa: Lippincott Williams & Wilkins; 2001. 711-31. Rosendaal FR. Risk factors for venous thrombotic disease. Thromb Haemost. 1999 Aug. 82(2):610-9. [Medline]. Warren BL, Eid A, Singer P, et al. Caring for the critically ill patient. High-dose antithrombin III in severe sepsis: a randomized controlled trial. JAMA. 2001 Oct 17. 286(15):1869-78. [Medline]. [Full Text]. Zhou A, Huntington JA, Carrell RW. Formation of the antithrombin heterodimer in vivo and the onset of thrombosis. Blood. 1999 Nov 15. 94(10):3388-96. [Medline]. [Full Text]. Larsson H, Sjöblom T, Dixelius J, Ostman A, Ylinenjärvi K, Björk I. Antiangiogenic effects of latent antithrombin through perturbed cell-matrix interactions and apoptosis of endothelial cells. Cancer Res. 2000 Dec 1. 60(23):6723-9. [Medline]. Sarper N, Orlando C, Demirsoy U, Gelen SA, Jochmans K. Homozygous antithrombin deficiency in adolescents presenting with lower extremity thrombosis and renal complications: two case reports from Turkey. J Pediatr Hematol Oncol. 2014 Apr. 36(3):e190-2. [Medline]. Eisele B, Lamy M, Thijs LG, Keinecke HO, Schuster HP, Matthias FR. Antithrombin III in patients with severe sepsis. A randomized, placebo-controlled, double-blind multicenter trial plus a meta-analysis on all randomized, placebo-controlled, double-blind trials with antithrombin III in severe sepsis. Intensive Care Med. 1998 Jul. 24(7):663-72. [Medline]. Warren BL, Eid A, Singer P, Pillay SS, Carl P, Novak I. Caring for the critically ill patient. High-dose antithrombin III in severe sepsis: a randomized controlled trial. JAMA. 2001 Oct 17. 286(15):1869-78. [Medline]. Pabinger I, Vossen CY, Lang J, Conard J, García-Dabrio MC, Miesbach W, et al. Mortality and inherited thrombophilia: results from the European Prospective Cohort on Thrombophilia. J Thromb Haemost. 2012 Feb. 10(2):217-22. [Medline]. Wiedermann CJ, Hoffmann JN, Juers M, Ostermann H, Kienast J, Briegel J, et al. High-dose antithrombin III in the treatment of severe sepsis in patients with a high risk of death: efficacy and safety. Crit Care Med. 2006 Feb. 34(2):285-92. [Medline]. Tagami T, Matsui H, Horiguchi H, Fushimi K, Yasunaga H. Antithrombin and mortality in severe pneumonia patients with sepsis-associated disseminated intravascular coagulation: an observational nationwide study. J Thromb Haemost. 2014 Jun 19. [Medline]. Gando S, Saitoh D, Ogura H, Mayumi T, Koseki K, Ikeda T, et al. Disseminated intravascular coagulation (DIC) diagnosed based on the Japanese Association for Acute Medicine criteria is a dependent continuum to overt DIC in patients with sepsis. Thromb Res. 2009 Mar. 123(5):715-8. [Medline]. Cai K, Osheroff WP, Buczynski G, Hotta J, Lang J, Elliott E. Characterization of Thrombate III®, a pasteurized and nanofiltered therapeutic human antithrombin concentrate. Biologicals. 2014 May. 42(3):133-8. [Medline]. Oelschläger C, Römisch J, Staubitz A, Stauss H, Leithäuser B, Tillmanns H, et al. Antithrombin III inhibits nuclear factor kappaB activation in human monocytes and vascular endothelial cells. Blood. 2002 Jun 1. 99(11):4015-20. [Medline]. Cell surface–directed hemostasis (image adapted from Hoffman M, Monroe DM 3rd. A cell-based model of hemostasis. Thromb Haemost. 2001). Initially, a small amount of thrombin is generated on the surface of the tissue factor–bearing (TF-bearing) cell. Following amplification, the second burst generates a larger amount of thrombin, leading to fibrin (clot) formation.